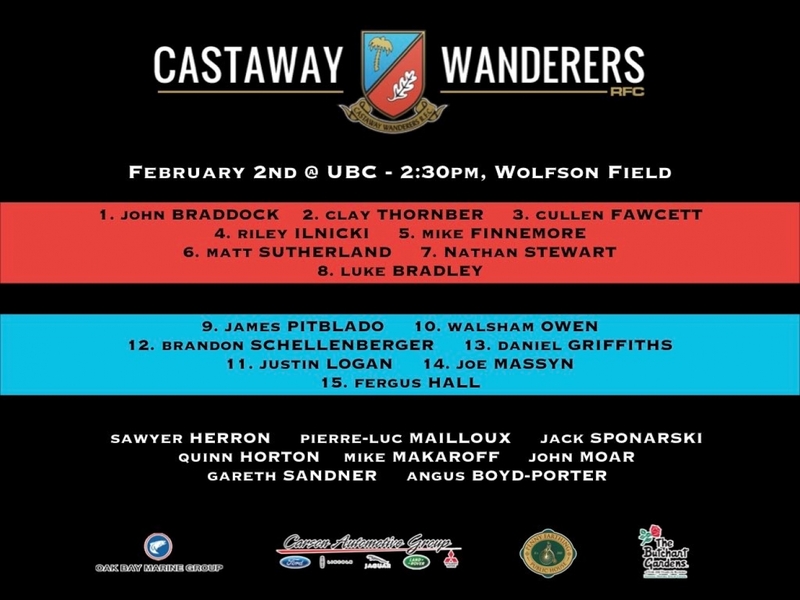 CW is off to UBC tomorrow to put their unbeaten record on the line. Last week they amassed a huge total in Seattle but came away the worse for wear with some seven injuries making players unavailable for selection this weekend. This will really see what the club is made of as players have been “called up” to “man up” and make their claims for regular selections at the higher levels. Most interesting of all is the “resurrection” of Fergus Hall. Far from Castoff, Fergus has had a couple of years of Wandering following graduation and now returns to his club, full circle. As a youth around CW and Wallace Fields, Fergus was tipped by many to wear the Red of his country beyond his junior years when he represented the U20’s; was BCHS’s Male Athlete of the Year in 2013 and part of a large CW cohort to Uvic in 2014 (Parker, Ehrlic, Bos, Nishima-Miller, McCloskey, Cambridge, R. Prevost, M.Tate). These predictions have not come to fruition to date and in fact, as is often the case of a full-on life of rugby and studies, young men often seem to need the break to become grounded again. A lot will be on his shoulders as he returns to the custodial position to replace an injured Dalsin. Also earning their first starts this season are Dan Griffiths who joins CW from Burnaby Lake and Joe Massyn, a student from South Africa. Other tweaks will be Ilnicki starting again in the engine room, Fawcett maintaining his starting FRF position after a stellar effort last week, Suddsy moving to the flank to cover Dawes. In the backs, Owens moves into the #10 spot for Hall to link with the increasingly reliable Pitsy at #9. The TBirds will feature big James Carson in the front row this time round. He always puts on a good show for the clan and comes up big against his youth Alma Mater. The UBC back row is a force to be reckoned with, led by Ruttan and Ikeda, they will give the visitors all and more of what they may want. The backs contain some familiar faces but also some newbies to this pundit and as per usual, they are linked by an experienced and talented pair of halves with pace to burn outside. Despite the changes in The Tricolors line-up, I would predict they will put on a show and the final scores line will be close, with the home team using that advantage to their favor. The pitch and stadium, lights and change rooms are second to none in the league and UBC somehow seem to know how to milk the most out of their advantage. In the curtain-raiser, the “call ups” might just prove to be too much for the visitors and despite a backfield that might challenge, overall it will be a tough task based on form to date. JUST WHO WILL EARN THE SPOILS?